This entry was posted in Germany Immigration Visa and tagged EU blue card Germany Germany Employment Visa immigration in Germany on July 4, 2016 by Blog Author. Who doesn’t love to live with their loved ones? The pain of separation cannot be gauged. It is harder for the career-oriented people who migrate to distant lands. Meeting the family after a long time gives such relief. Immigration is no more phenomenal, but quite common. The countries that allow migration also provide and support immigration of families. Germany, one of Europe’s largest economies, has been welcoming immigrants. It is essential for the burgeoning economy to attract skilled professionals and fill the skill shortages. So, all the people who come to Germany to work will have the option to bring their family members to Germany. The skilled individuals and students, who have secured residence permit in Germany, can sponsor their family members. Spouses and children aged below 16 can join their relatives in Germany. The European Union citizen doesn’t require a permit to enter Germany. All other foreign nationals living in Germany with available residence permits can bring their families to Germany. 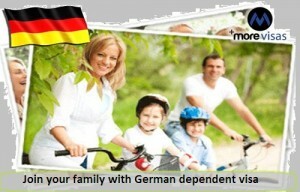 The spouses who join their relatives will have the opportunity to work in Germany. Visa processing is a comprehensive and complicated procedure and interested candidates can contact our centers or visit our website morevisas.com. If you want to apply, please fill out our Enquiry Form, so that one of our visa expert will get back to you.